If you said that majoring in supply chain management at Iowa State University was the most important preparation Rachel Gumpert had for her job as a Cabin Procurement Support Specialist, you would be right, of course. But something else gave Rachel a solid foundation for her role at the Airbus U.S. Manufacturing Facility. A Virginia native, Rachel moved several times, as her father took on a series of assignments in the U.S. Army. Every two or three years, Rachel would start over, forging new relationships with individuals and groups, and establishing new lines of communication. As it turns out, that may be the most important aspect of her job. “It teaches you to appreciate meeting new people and working with anyone and everyone you meet. You can learn a lot from people who have different backgrounds when you genuinely care,” Rachel said. 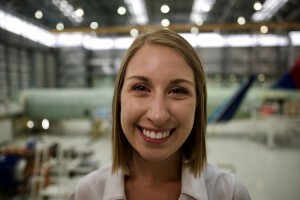 Today, in Mobile, Rachel is finding her childhood experiences gave her a solid foundation she builds on every day at Airbus as she collaborates with 20 major cabin suppliers and a dozen or more suppliers around the globe. “Working with Airbus has definitely helped me to grow professionally, but also personally, especially in communicating, because Airbus is international. I have a call with Germany every day. I talk to them, travel to their country, learn about their culture, and learn from expats here in Mobile,” Rachel said. With the ramp up in production that began in the fourth quarter of 2017, the entire process of communication had to speed up accordingly. Rachel says it helps that at Airbus there is a genuine, working sense of teamwork. 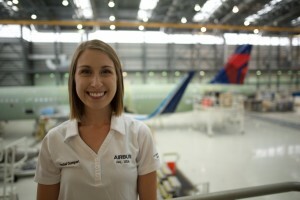 Rachel’s training in logistics could be applied to any complex business enterprise, but she found her way to Airbus in Mobile because her husband Andrew—whom she met in high school—is an aerospace engineer. She interned at Textron to get a taste of the industry, just as her husband did with Airbus. Today, Rachel works at the FAL, and Andrew is at the nearby Airbus Engineering Center. Rachel’s work requires her to tap into her previous experience and training, and to master a wide array of tools, including SAP and eight other primary software programs. Since arriving at the Final Assembly Line (FAL) in April of 2017, Rachel and the cabin procurement team found they have become increasingly adept at anticipating issues that may arise and at heading them off before they threaten production targets. It requires them to factor in the entire schedule of the FAL and Flight Line and prepare their on-site suppliers for times when multiple milestones overlap. “As we mature as a facility, we are better able to look ahead and see problems. Now, we’re more likely to know early on when something might become an issue,” Rachel said. Last summer, Rachel had a chance to share her knowledge with colleagues from manufacturing facilities across Airbus at an internal company “summer camp” —and to learn from them, as well. At the camp, Airbus colleagues from around the world share ideas, innovations, and best practices in a relaxed setting. “Our team presented a new form of Digital Station Board to track outstanding work on each aircraft. We created a mockup to give an overview of how we wanted the program to look,” Rachel said. After formal studies in college, an internship, and more than a year on the job in Mobile, what advice does Rachel offer for the next generation interested in a career in high-tech manufacturing or supply chain management? It all comes back to communication. “What’s really important in a role like mine is an ability to work with many different groups of people, so my advice would be to learn to enjoy that communication, get better at that communication while you are young. It will help you a lot,” Rachel said. With the announcement of the new A220 project in Mobile, Rachel sees a bright future for the Mobile area and for Airbus. “I think a lot of people are going to be attracted to move here. I can see not only people from other companies, but other sites in Airbus wanting to come work on the A220. And people at the FAL are excited to maybe take their experience and start another project. In the future, I see a lot of growth, and a lot of A220s produced, along with the A320 family,” she said. Rachel appreciates the sense of support and pride she feels toward Airbus from the Mobile community. Away from work, Rachel and Andrew enjoy fixing up their new house, running, canoeing, or just cooking out and playing a board game with friends.